The gap between who designers and developers imagine their users are, and who those users really are can be the biggest problem with product development. Observing the User Experience will help you bridge that gap to understand what your users want and need from your product, and whether they’ll be able to use what you’ve created. Filled with real-world experience and a wealth of practical information, this book presents a complete toolbox of techniques to help designers and developers see through the eyes of their users. It provides in-depth coverage of 13 user experience research techniques that will provide a basis for developing better products, whether they’re Web, software or mobile based. In addition, it’s written with an understanding of product development in the real world, taking tight budgets, short schedules, and existing processes into account. 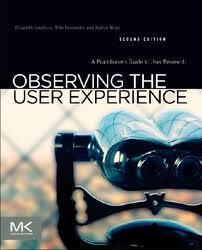 Since the publication of the first edition, the business of user research has exploded with new technologies and new techniques. This second edition takes those changes into account with extensive revisions to existing topics. It also adds entirely new material on observational research, mobile usability, diary studies, remote research, and cross-cultural and multilingual projects.